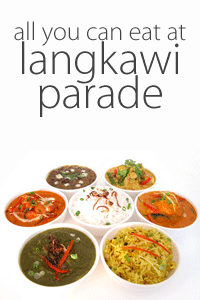 Come indulge your taste buds at Langkawi Parade Megamall! Our third level food court offers both local and international favourites seven days a week. On the menu are rich tasting sizzling noodles and claypots, Laksa, traditional Nasi Campur and Chicken Rice along with many varieties of noodles and rice dishes. Marrybrown Fast Food Restaurant on the first level offers fast food with a local twist! Most popular menu items include Chicken burger, Hot Touch burger, Curry Mee and Nasi Marrybrown. Pop in now for somethin’ different! The El Manar Arabic Restaurant serves up tasty Arabic and north Indian cuisine in a cosy and comfortable space. With an assortment of flavours on its menu, get ready for a new culinary experience. Signature dishes include their ever popular Chicken Tikka Masala with Bryani Rice, classic Falafel, Kebab and Shish Taouk.